Favoring instrumental gesture over the fake sound of the very word ‘love’, HOAX HOAX is a trio of musicians whose texture of sound conjures up unstable and swaying landscapes. The long journey you take through their acoustic panoramas, and the wide spectrum of emotions it raises, thus engender a feeling of obstinate strength,of determination to fill vacant space, to do and undo the void. HoaxHoax was created in 2011 by Virgile Abela,David Merlo and Damien Ravnich. During the first two years, the three musicians chose to work behind closed doors, freely developing their repertoire. Then, in 2013, came time for concerts. The first EP was released, after a live session recorded at the Espace Julien in Marseille, and a series of about twenty concerts was given throughout France and Belgium. This tour was a great opportunity for HOAX HOAX to share the set with bands such as ENABLERS (US), LUNATIC TOYS (FR), UZEDA (IT),LO MONADE STANCA (IT), THE LAST VOLT (BE), and therefore to develop a strong network. Back from their tour, they considered the project of a first record with Olivier R in Onde Source studios based in Marseille. Starting from there, the trio followed a long and methodical process regarding musical creation, as well as structuring of their project. Meanwhile, the band also set up a scenic project called Shot Revolver, and which also gave its name to the album. The fabulous graphic constellation exclusively imagined by Nicolas Gerber for this project is visually developed on the 2015 album cover, and the DIY craftwork on the vinyl, using silkscreen and stamps, makes each record absolutely unique. 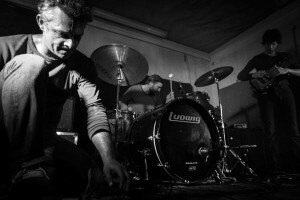 Within two years, HoaxHoax managed to create the conditions for the release of their first album, on 4 different media, and with 4 companies, in France and abroad (US, Europe and Japan).